With movement your muscles contract and extend within their normal range. When these muscles are extended or contracted outside of their normal range of motion, for example with trying to lift too much, the muscle cannot recover and it becomes inflamed, swollen or stiff due to fatigue. This causes compression of the space between the skin and the muscle, which in turn restricts lymphatic flow, inhibiting fluid from draining out of the area. This fluid applies pressure to the pain receptors under the skin, and sends “discomfort signals” to the brain, which we then interpret as pain. Traditional athletic tape was designed to restrict movement of muscles and joints, and to provide support. To achieve this support, many layers must be applied, applying significant pressure to the area, obstructing the flow of body fluids. 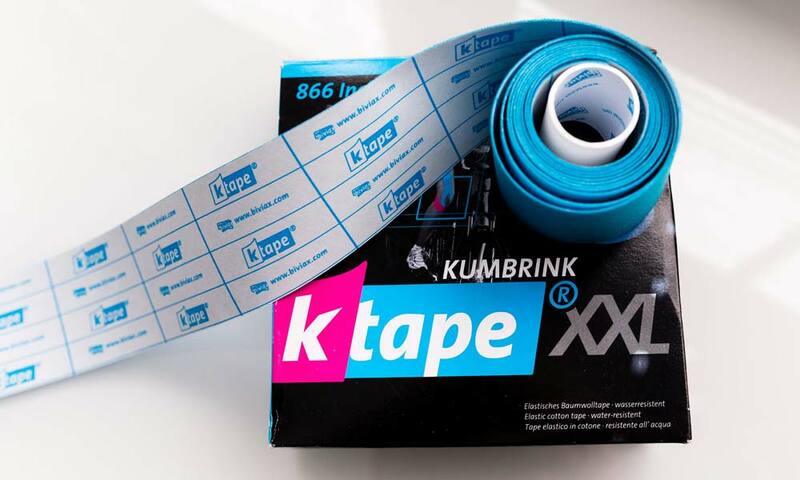 Kinesiotape®, on the other hand, follows a different philosophy; Kinesiotape® gives range-of-motion. It allows the muscular system to heal itself biomechanically. The elasticity of the tape ensures the muscles have free range-of-motion, but are not over-exerted. Kinesiotape® is applied over the muscles to reduce pain and inflammation, relax fatigued muscles, and support movement on a 24 hr/day basis. It is non-restrictive and allows for full range-of-motion. Because of its water resistant nature, it can be worn for 3-5 days. It is latex-free, making it hypoallergenic and safe for most patients. It does not cause any compression of the skin, making it “light to feel” allowing comfortable wear. It can be used for almost all clinical conditions.